Subscribe to receive a farm-share during all three of our sessions or just the ones you want with the button below. Farm-shares come in two sizes, Family and Single. Family shares should feed up to 4 people per week while Single shares can feed 1 to 2 people in a week. After signing up through the link above, come out to either of our 3 locations to pick up your produce starting May 25th at the THEARC! Forget to pick up your farm-share one week or going away for a week? Skip a week of produce without penalty! Local women farmers and farmers of color! 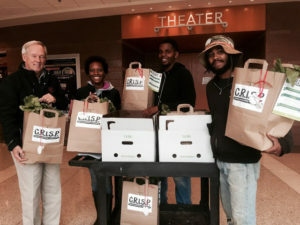 Most of the produce provided through C.R.I.S.P. comes from Black-run farms in the eastern half of Washington, DC. The rest is sourced from farmers in Maryland and Virginia–no farm too far to visit in less than a day’s drive from the District. We will also have local honey! And other products made by local herbalists, food-entrepreneurs and other producers of color. Products offered will be seasonal and offered as available. Best of all, C.R.I.S.P. is now a Market CSA Want to switch a few share items out for other items being offered that day? Or purchase some extra produce? Go ahead and shop the rest of our market offerings! Not sure what to do with that artichoke or acorn squash in your share? No problem! Free community cooking classes will be held at least once per month immediately following or during C.R.I.S.P. Markets at each of our three sites. Ten urban agriculture workshops are also being offered, so check our events calendar to sign up!